Will Congestion Pricing Help Seattle's Traffic Mess? The ‘period of maximum constraint’ is just around the corner, and even when it’s over, traffic downtown is likely to be worse than it is today. Can we toll our way out of this mess? STOPPED UP: Today, traffic barely moves through downtown on Fifth Avenue during rush hour. Could congestion pricing help? This article appears in print in the December 2018 issue. Click here to subscribe. January 2020: The downtown Convention Center is under construction, kicking almost 600 buses out of the downtown transit tunnel and closing down the ramps that now give buses direct access to the Interstate 5 express lanes. Those buses now share city streets with more cars than ever, as hundreds of drivers divert to the street grid, avoiding the new Alaskan Way tunnel, which has a $2.50 toll (during nonpeak hours) and no downtown exits. Meanwhile, the old Alaskan Way Viaduct is still being demolished, KeyArena reconstruction is creating traffic chaos in South Lake Union, and a growing number of commuters are choosing Uber and Lyft over buses that are often off schedule or full, adding to congestion. But what if there was a way to alleviate all this predicted chaos—a period the city refers to, drily, as the “period of maximum constraint”—without forcing people to get up at 4 a.m. to beat traffic, or work from home? Some city leaders, including Mayor Jenny Durkan, think they may have found a solution in a concept called congestion pricing. The idea is simple: Charge people to drive into the center city during the times when congestion is worst, and use the revenues to fund alternatives to driving, such as increased bus service. Voilà: fewer vehicles, faster transit, improved air quality (car and truck trips account for half of Seattle’s greenhouse gas emissions), and safer streets for bicyclists and pedestrians. In practice, of course, it isn’t so simple. In 2017, the Seattle City Council authorized $200,000 for a study on the effects of tolling downtown streets—an idea that will require voter approval to move forward—as well as other options, such as taxing Uber and Lyft rides, that would not require a public vote. In September, Durkan released a budget that provides another $1 million for the city to study congestion-pricing options in more detail and to conduct outreach to community members and businesses, with the goal of implementing congestion pricing by 2021, when the mayor’s first term ends. Technologically, congestion tolling is pretty simple: The city would create a cordon of virtual checkpoints at the edges of the tolling area and charge drivers, using special car-mounted transponders, whenever they enter the area during the times when tolls are in effect. This is exactly the system most states, including Washington, already use to toll state highways, such as the State Route 520 bridge across Lake Washington. 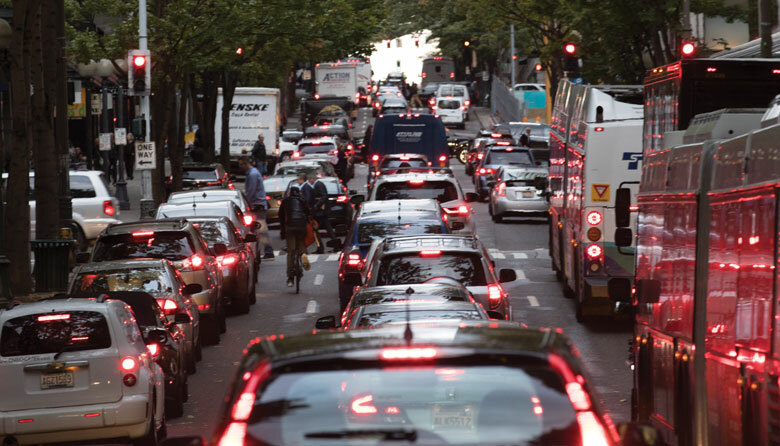 Where it gets more complicated, according to Mark Hallenbeck, director of the University of Washington–affiliated Washington State Transportation Center, is when the city starts making choices about who to charge, and when, and where. If South Lake Union is included in the tolling area, should people who live on Queen Anne get a free pass because they need to go through the neighborhood to get to I-5? If some low-income workers have no choice but to drive downtown, should the city create a low-income or nighttime exemption to the pricing scheme? All of these choices have consequences, and costs. “It’s not clear to me what problem we’re trying to solve here,” Scholes says. “[Durkan’s announcement] feels a little divorced from any clear strategy or plan. The constraints we have are the need for more transit capacity—more buses are driving by full, and the light rail system is taking longer to build than anyone wants—and the need for more housing. Generally speaking, we think we should focus our efforts there,” not on tolls, Scholes says. Other skeptics of congestion pricing have expressed concern that tolls will disproportionately harm low-income people who have no choice but to drive to work, often from homes far outside Seattle city limits. “The suburbanization of poverty is real,” says City Council member Rob Johnson, who supports creating a program to reduce costs for low-income drivers, similar to the existing ORCA LIFT low-income transit pass. “We’re pushing people out of the city and we’re not going to be able to build transit” fast enough to serve all the low-income workers who would be impacted by congestion pricing, Johnson says. It’s unclear exactly how many low-income workers would actually be impacted by congestion pricing. In 2017, a Puget Sound Regional Council report concluded that low-income commuters “were much more likely to walk and take transit than the overall population”—a finding that corroborates a 2009 Washington State Department of Transportation report that found that “The poor are less likely than the non-poor to commute in a personal vehicle and more likely to commute using public transportation or other modes that would not be subject to tolls.” According to data from the U.S. Census Bureau’s American Community Survey, just 37 percent of Seattle residents under the poverty line drove to work alone, compared to 48 percent of those making more than 150 percent of the poverty level. “One of the things you hear whenever you talk about a congestion-pricing scheme is, ‘This will be unfair to low-income people,’ and there are a lot of anecdotes that get brought up that are certainly real,” O’Brien says. “But in a city like Seattle, where parking’s pretty expensive”—as much as $4.50 an hour for on-street parking downtown, and $10 an hour or more in private garages—“my sense is the majority of people who drive downtown are people who have a lot of options.” The way to address the needs of lower-income people who must drive downtown isn’t to reject congestion pricing altogether, O’Brien says, it’s to “design the system around their needs” so they won’t be burdened by extra costs; for example, by making it free to drive downtown at off-peak hours, when many shift workers start their jobs. For now, the city remains in study mode, with more reports focusing on equity, race and social justice, and priorities for spending toll revenues due out later this year. Then it will have to sell the idea to the public, which could be a heavy lift, and not just because Seattle would be blazing a trail on congestion pricing for the rest of the country. People tend to hate the idea of paying for things that used to be free unless they can see concrete benefits. In Stockholm, leaders actually put tolls in place about seven months before seeking voter approval. Once voters saw how a $2.15 toll to drive downtown impacted the city—reducing traffic in the city center by 20 percent and cutting childhood asthma cases in half—they approved the plan by a majority of 53 percent. In London, where drivers pay about $15 to drive into the center city on weekdays, congestion went down by 30 percent, and public transit gained tens of thousands of new riders. Editor’s note: The opening of this story, set in 2020, depicts a hypothetical situation. The Washington State Department of Transportation says that when the tunnel opens early in 2019, time-of-day tolls will vary from $1 on weekends to $2.25 during the afternoon peak. Currently, the Viaduct demolition is scheduled for completion mid-year 2019.